The origin of the name is not clear, but one theory claims that the cake was created in honour of the marriage in 1884 of Queen Victoria's granddaughter to Prince Louis of Battenberg , with the four squares representing the four Battenberg princes: Louis, Alexander, Henry and Francis Joseph. 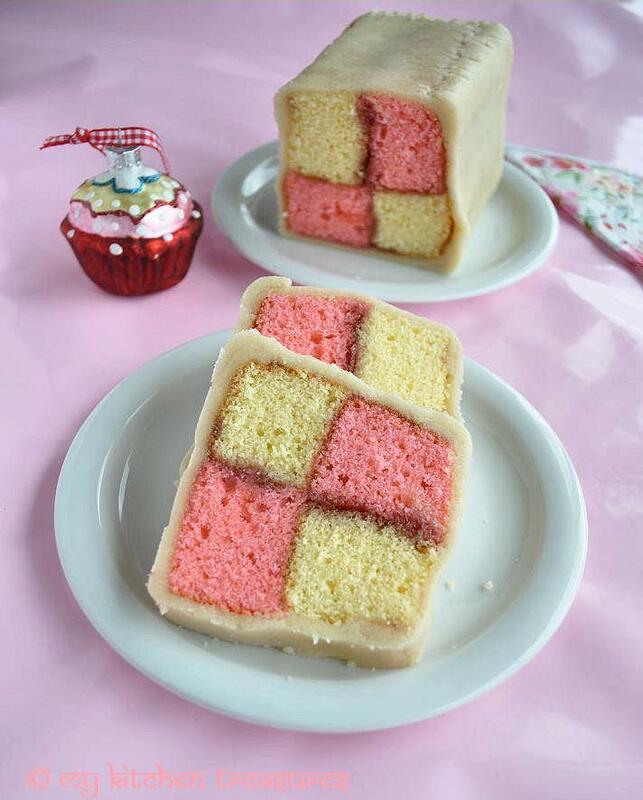 Battenberg cake is a light sponge cake. When cut in cross section, displays a distinctive two-by-two check pattern alternately coloured pink and yellow. The cake is covered in marzipan and, when sliced, the characteristic checks are exposed to view. These coloured sections are made by dyeing half of the cake mixture pink, and half yellow, then cutting each resultant sponge into two long, uniform cuboids, and joining them together with apricot jam, to form one cake. Established variations are for coconut flavouring to the sponge cake and lemon curd or raspberry jam in place of apricot jam. You can make this cake without the special pan, but then you just have to slice them . And me and slicing never go that good, as I know for sure I would not slice properly so I have been waiting to buy this pan for a while. This time I made Vanilla flavoured cake and colored one half oink, next time I am gonna try diferent flavours like Vanilla and Chocolate too. I used the recipe which was there together with the pan. Pre heat the oven to 180° c ( 350 F) Gas mark 6; grease and flour the Battenburg pan. Cream together the butter and sugar and vanilla untill light and creamy. Gragually add the beatern eggs. Divide the mixture into tow equal halves. Put a few drops of pink color into one of the mixture and gentley mix intill an even colour is achieved. Spoon the pink mixture into the two section of the tin, and the plain mixture into the other two sections. Place in the center of the oven and bake for approximatley 30 - 35 minutes or untill evenly coloured and firl to touch. If the cake has rissen above the tin, use a sereated knife to cut accross the top to remove the excess cake. Remove the cake from the tin. When completley cold, brush the abpricot jam onto the side and join one plain and one pink slice together and then one pink and one plain on top creating a chequered pattern. Now brush the apricot jam over the long sides. Roll out the marzipan on some sugar making a rectangle approx 20 x 30 cm. Neaten the edges. Place the cake into the marzipan so the one edge is lined up to the edge of the marzipan and completley wrap the marzipan around the cake. Trim away any surplus marzipan to make a neat cake, just trim bith ends with a clean knife. For me covering the marzipan was the most difficult part of making this cake. very cute! i can just imagine a chocolate and strawberry contrast! yumm for the colours and the flavours! This is such a beautiful cake, never seen one like this before. This looks so cute, my little girls will love these pink delights. That is a VERY cute cake, looks perfect! I like the pink and white combo too! someday, i want to come over and have all ur baked goodies around me to just take in their beauty and sample.:)gorgeous!!! ohh dear that looks so amazing...i was sold by the time you said marzipan....looks lovely and spongy. beautiful work! once again the English have enlightened me, this time in a good way lol! 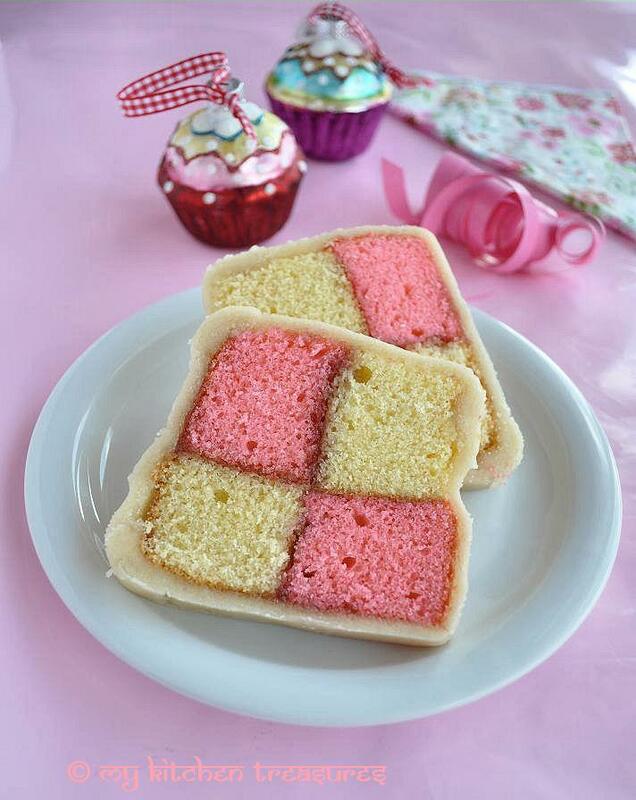 Oh my..this cake looks so cute..love the patterns..I've been eyeing the Checkerboard pan for a while..hmmm!! How cool is that? This must be such a hit with kids too :) Makes for a very pretty presentation. wow this looks really cool! So is the mould! Great to know the story behind this pretty checker board cake! The pink is marvelous! Cute looking checker cake..never seen that cake tin before..Have to check it out..
Gorgeous is an understatement. I am in love with it. Ultra yummy looking cake! !Loved the the pink and white combo.. OMG!! very pretty Cake.would love to have a slice.Even Iam not good at slicing, I think it will be perfect if we have the special pan. This looks so amazing. The patterns in the cake always start that fear factor in me and I can never figure out how they look so pretty. Love the apricot jam and the marzipan. The cake is stunning! So pretty! And I've never been one to resist marzipan! Looks delicious HC. I have seen this cakes and always wondered about how to make them and here you are . Looks soooo fancy.. Lovely pics.. Delicious. Looks so yummy and colorful. You can sell these cakes they look so neat. Wow! Wish I could get a pan like yours and bake this delicious looking cake asp, Finla. Lovely color and texture. loved the pink int he cake and the entire concept of making the cake. If I buy any more baking utensils, I will have myself moved out of my own home!!! I am guessing the marzipan acts as an outer layer in holding uyp the cake together....Imagine making a 4 coloured cake???!!! Possibilities are endless!!! I remember when I was just beginning to get interested in cooking and baking, these kind of cakes used to fascinate me a lot. And I never knew till now there were special pans to bake them - I used to read all those instructions about how to bake and cut the cake so that the design would appear, and then of course, never make it all all. I used to bake marble cakes more frequently, though, because you didn't have to be precise with it. Oh my !! eyecandy ! Seeing something like this for the first time.. It's the first time I've heard of this cake but it looks beautiful. That old-fashioned cake is so pretty! I'd love to have such apan. Well done! This is stunning HC - I have always wanted to make one of these and not been game. Knew about the cake but not about the pan! Must be a boon. I have made this much before I began the blog and it was a version with eggs. Very tasty one. I am bad with slicing too:). Your cake looks absolutely mouthwatering. Wow this looks sensational! I love the colors... all so pretty. What a fabulously loking colourful cake! So festive & special too, my friend! This is such a beautiful cake! You did a great job with this one! Those are so adorable! And I bet delicious too. delicious cake...my favorite! 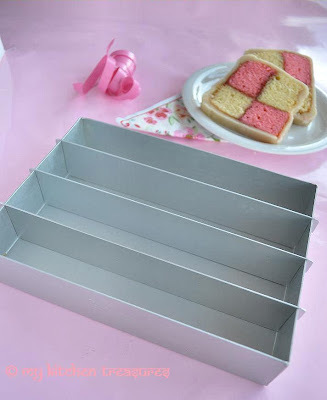 but never knew there is a tray specially for making it..
oh wow!! Beautiful clicks.. looks so delicious..loved it..
cake is soooooper pretty, girl!!. seriously thinking of shifting near you ;) ;)! Wow, what a cute looking cake, love the way you presented and the colors are just so inviting :-) Beautiful! wooo thats tooooooo good dear..kids will surly fall in love with this cake..
Looks absolutely fabulous! Love your cake. very beautiful.. I have a reason now to buy that pan. I love this recipe and your pan! How gorgeous! That is absolutely beautiful!